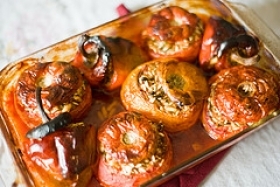 Have you made Baked Tomatoes Stuffed with Orzo? 1. 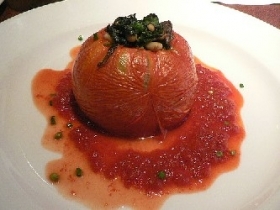 Remove the center pulp and seeds from the tomatoes, hollowing them out well. 2. 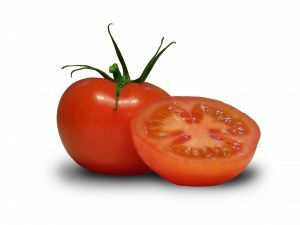 Lightly sprinkle into each tomato a little sugar, salt, pepper and oregano; place four cubes of mozzarella in each tomato. 3. Preheat oven to 400-degrees. Melt the butter in a saucepan and saute the onion in it until soft; stir in the orzo, stirring well so each grain of pasta is coated. 4. Pour in 2 cups of the chicken broth, stir well, and simmer until it is absorbed, adding more broth gradually until the orzo is about three quarters cooked; firmer than al dente (I cooked mine longer--don't like pasta that firm). 5. Taste it as you go and cook until it's as firm as you like. 6. Blend in the Parmesan, stirring it in well. 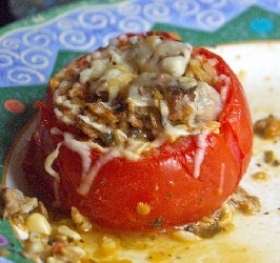 Spoon the orzo mixture into the hollowed tomatoes, filling them. 7. 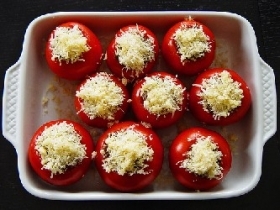 Place the filled tomatoes in a casserole or baking dish with 1/2 cup of hot broth in the bottom of the dish. 8. 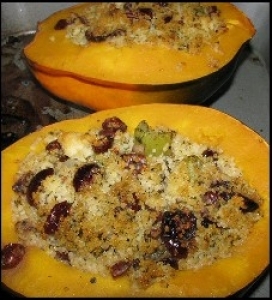 Bake, covered, for 15 minutes; remove the cover and cook an additional 10 minutes. 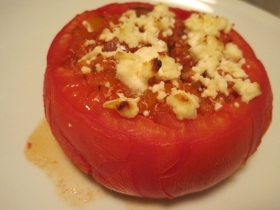 This recipe contains potential food allergens and will effect people with Wheat, Butter, Gluten, Tomato, MSG, Poultry, Cheese, Onion allergies.